During the month of January, The Pie Hole in Orange is celebrating the new year with fruit, nuts and yogurt and a citrus flair, by introducing a Candied Blood Orange Yogurt Pie and Blood Orange Ginger Latte. 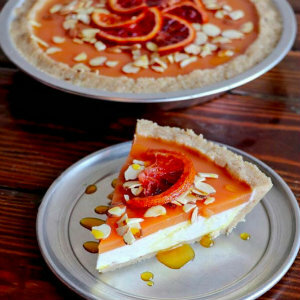 The Candied Blood Orange Pie starts with a pecan shortbread crust filled with tangy yogurt sweetened with a bit of brown sugar, topped with blood orange gelée and almonds, then drizzled with spiced orange syrup. The Blood Orange Ginger Latte is made with the Pie Hole’s housemade spiced turmeric and ginger orange syrup, garnished with a housemade candied blood orange slice. If you’re already looking forward to your first cheat day on your New Year’s fitness resolution, try one of the bite-sized pie holes and keep the guilty pleasure to a minimum. Pie Holes come in seven flavors: Caramel Apple, Blueberry Crumble, Mexican Chocolate, Nutella, Boysenberry, Guava Cream Cheese and Strawberry Lavender, and can be purchased individually for $1 or a Baker’s Dozen for $12. 8 a.m. -10 p.m. Monday to Wednesday; 8 a.m. -11 p.m. Thursday; 8 a.m. -12 a.m. Friday and Saturday; 8 a.m. -11 p.m. Sunday. 177 N Glassell St. in Orange. 657.236.4100.